Arriving in Maun, we didn’t have much time to chill before we had to pack up for our 3 day/2night mini “break within a break” trip to the Okavango Delta. 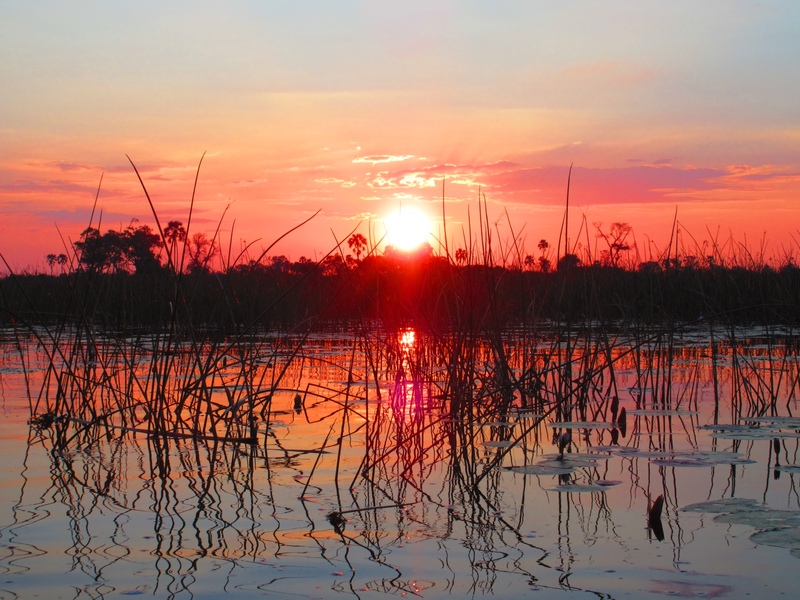 The Delta is an huge expanse of land in Northern Botswana that is covered with fresh water that flows south from Angola, with huge areas of rivers and islands teeming with wildlife scattered throughout the region. 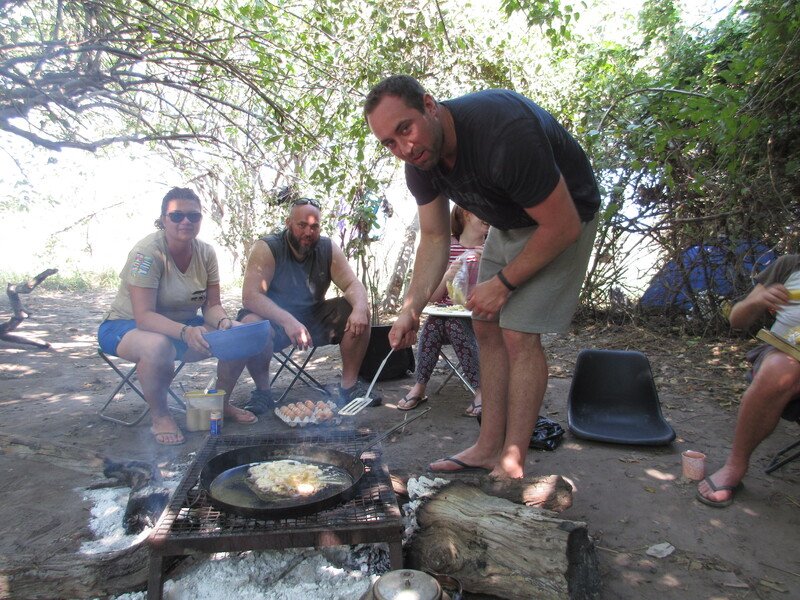 I was looking forward to having a smaller group dynamic as it turned out that only about 1/2 of the group wanted to go, the rest elected to stay in the campsite in Maun. This was going to be very basic camping with no facilities, no electricity, no cooking facilities beyond a fire we made ourselves. To get to the island where we’d be rough camping involved a very attractive aspect of the trip – sitting back in a Mokoro – a traditional wooden (now made primarily from synthetic materials) canoe that sits very low on the water and can be “driven” with a long wooden pole that is reminiscent of the methods used by gondoliers in Venice. 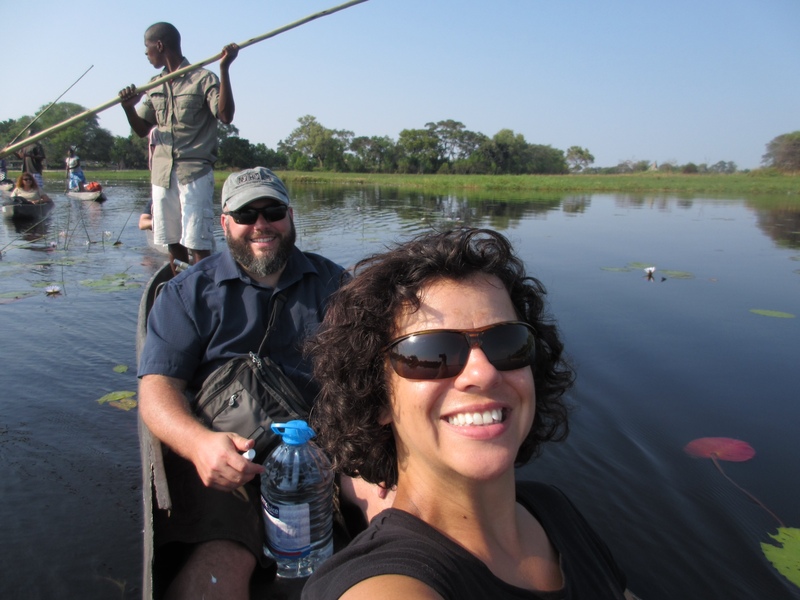 We drove about an half hour outside of Maun to a tiny rural village, where we were met by our Mokoro paddlers and camping “crew” and helped load the canoes with our equipment, food, and water for the stay. The canoe ride out to the island lasted around two hours and was an almost hypnotically relaxing experience. Just being able to lay back in the sun with legs outstretched and just watch the water glide by, covered in giant Lilly pads with frogs croaking and crickets chirping the only noise that broke the haunting silence. It was lovely. Upon arrival, we were told that our itinerary during our stay would involve early morning game “walks” where we would head into the interior of the island and try to spot Elephant, Zebra, Antelope, Wildebeest, and if we were very lucky, a big cat (though I wasn’t too sure how excited I would feel if I saw a lion wandering around when I was on foot) while the middle of the day would be taken as a giant siesta due to the extreme heat and humidity making it difficult to do anything active. It was a very peaceful and refreshing two days spent in the Delta. Without much to “do” when resting in camp, we were able to slow down our pace completely and fill the time with conversation in the group, playing games, reading, napping, and taking a swim in the “hopefully – “wait! What was that noise?! !” non-crocodile infested waters. We even played a great game that relied heavily on charade-like skills and it was thoroughly enjoyed by all. The highlight for me was the late evenings. We would cook our meals as a large group and eat all around our communal campfire. Then we’d go out to the riverside and just bask in the glory of the un-illuminated night sky that shone brilliantly with thousands of stars, while simultaneously watching the flashing sparks of the lightning bugs that lit up the air nearer the ground with their glow. Though difficult at times, we also tried to listen…intently listen – to the beautiful silence that accompanied the hum of the crickets (which Andy humorously dubbed to sound like clanking beer bottles) in the night sky. Every now and then, the sounds of the crickets were poignantly interrupted with the low groans of the hippos standing nearby, or the laugh of a hyena. It was eerie, and a little hair-raising, but deliciously exciting and adventuresome at the same time. We walked for miles on our game walks and did manage to spot several different kinds of wildlife – elephants, zebra, wildebeest and giraffe among them. Our guides were enthusiastic to explain anything we might want to know about the delta and how to keep safe when walking so close to these amazing creatures. We were warned of the false charges that the elephants can make – exhorted to stand our ground, and not run, should one of them decide to. On the last night, our crew entertained us with local songs and dances around the fire. Then we played a nerve wracking game called ‘Chief” which by a process of elimination left only the quickest witted amongst us still standing at the conclusion. 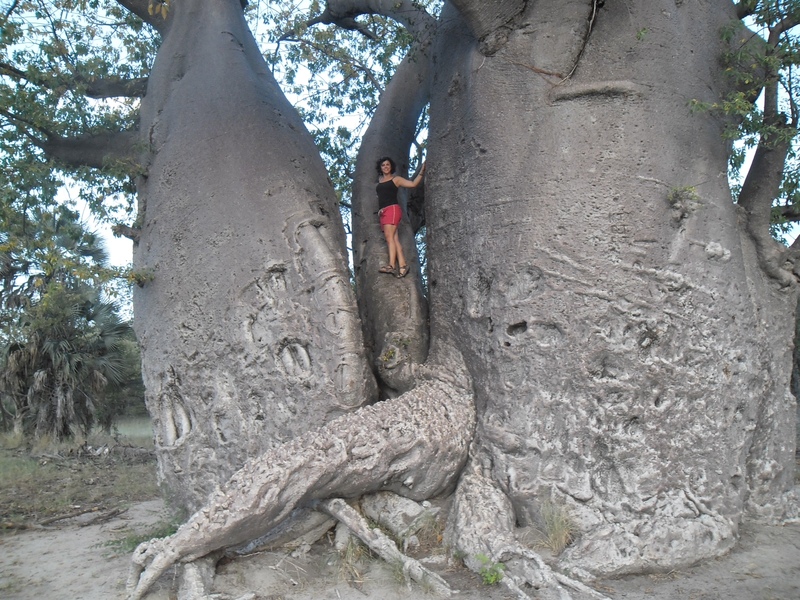 By the time it was time to turn the mokoros around and head back to Maun, I felt like a more wound-down version of myself and like I’d formed a closer bond with the individuals who decided to come along. We hadn’t partied, hadn’t sang music loudly till the wee hours of the morning, but we’d thoroughly appreciated the rest, return to nature, and peace that the Delta provided to us. On arrival back in Maun, we were very grateful to have an hour or so to re-humanize with a shower, and try to check some email, though this turned out to be an exercise merely in frustration. 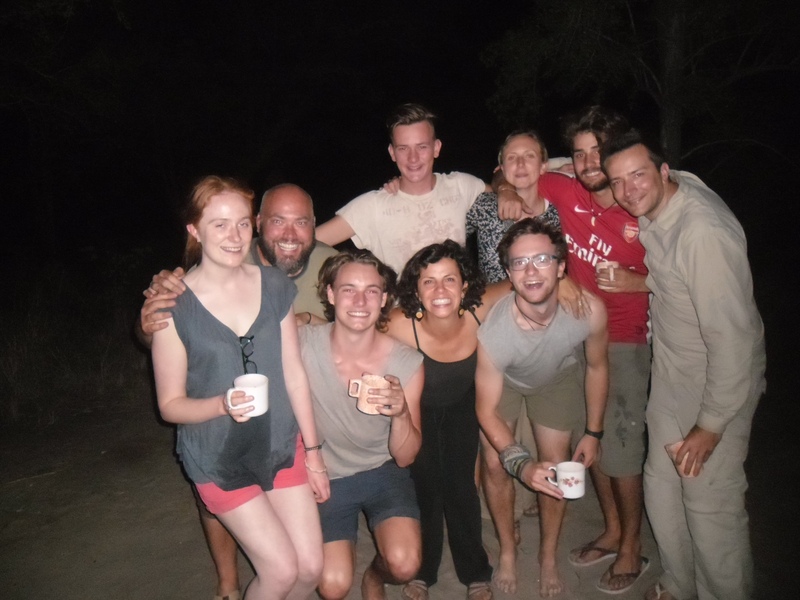 We were bush camping that evening as we headed out of Botswana in the direction of the Namibian border – which we would cross the following morning, which also just happened to be my birthday. It’s not every birthday that you get to go to Namibia. But I did. Funnily enough, on a 56 day trip, it was only on my birthday that I overslept by accident – Maud’s alarm clock failing to wake us up in time for our 6am departure. We still managed to eat, pack, take down the tent, and use the “facilities” (a hole that you had to dig with a shovel) in under 20 minutes! The border crossing passed without any more incident than the final foot & mouth disease shoe-washing checkpoint – and two customs’ officers who failed to notice that it was my birthday upon stamping my passport. It was a long drive day – but we were lucky enough to stop at a supermarket where I decided to buy ice and lots of goodies for myself to enjoy later that night in bush camp #2 – and technically, the 4th night of bush camping in a row. I ate a donut and got myself custard to have as dessert after dinner. Our campsite that evening was also unique in that it contained the largest Baobab tree in Namibia. 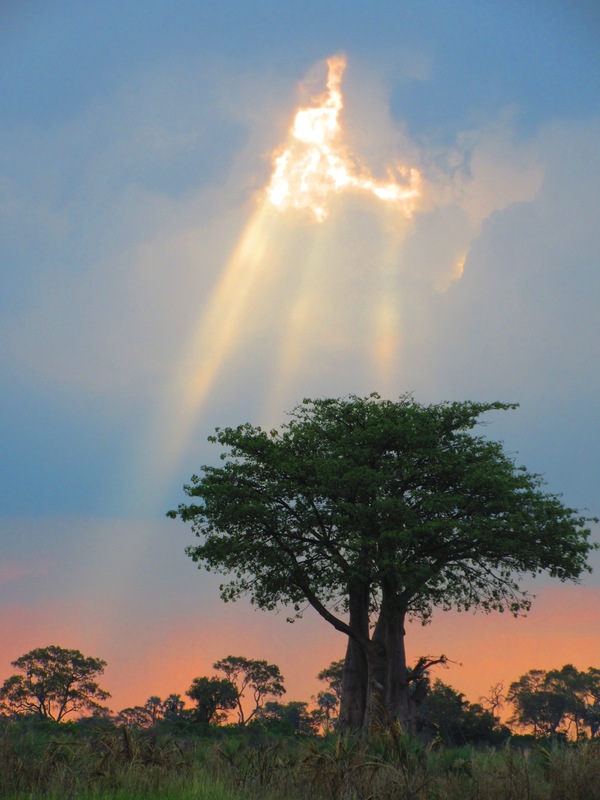 These trees are significant in that they look like they are “upside down” – meaning their branches appear as if they are, in fact, roots instead. We had fun taking pics climbing the massive tree as the sun set. Later, after dinner, we drank and danced to music – and I even sang a song for the group. 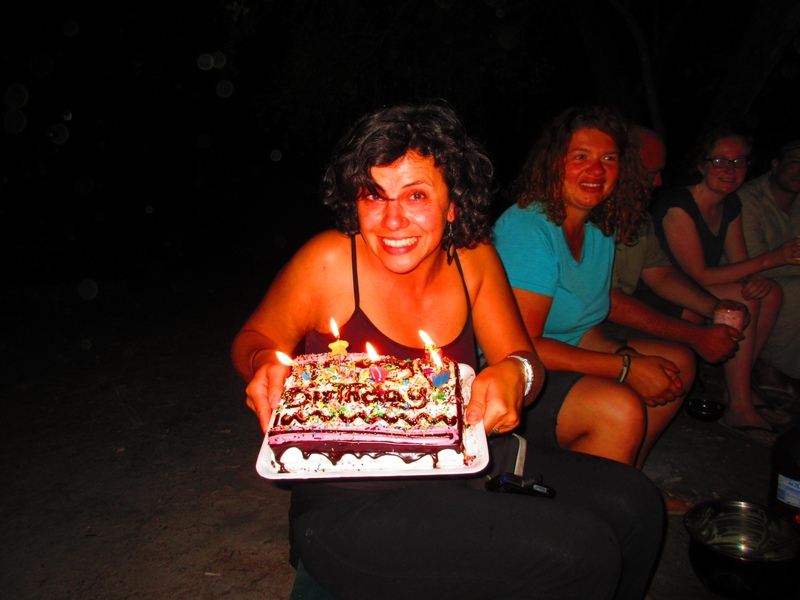 I got a birthday cake replete with candles that struggled to stay alight – but all in all – it was a lovely birthday celebration and I was grateful to have it here in the African bush. It was, as it turned out, entirely ironic that when the party was finally getting going, around 10pm, we were sent to bed after a small scuffle broke out between two of the lads. One of the few nights that I was in the mood to stay up drinking and dancing…and alas, it was not to be. Funny how that works out, eh? Happy Birthday lovely lady! sounds like it was s good one. Thank you, Nolan! It was a strange one…which is good I suppose! Awww…it makes me happy that you’re still reading along…I would have loved you to be there with me, G!! 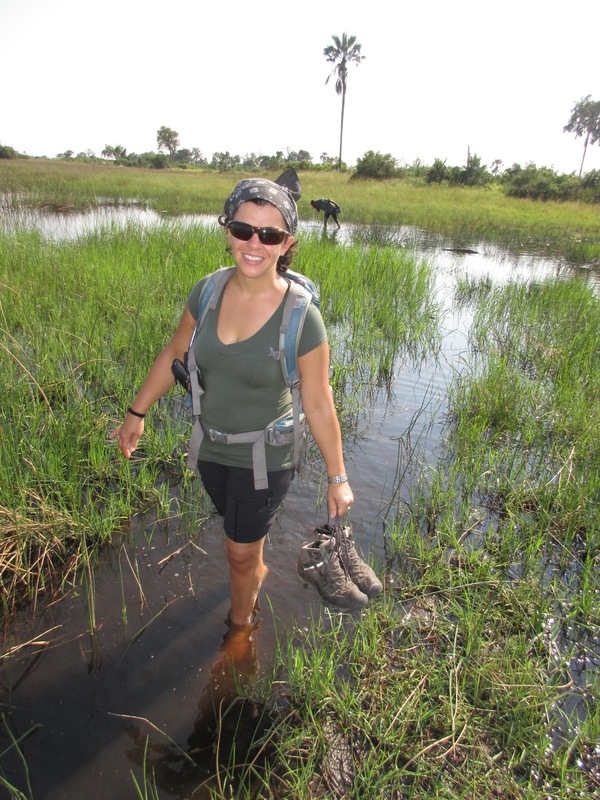 As for the croc infested waters….bah! YOU swam in water with me that was “probably croc-free” in Australia, remember? Great post! 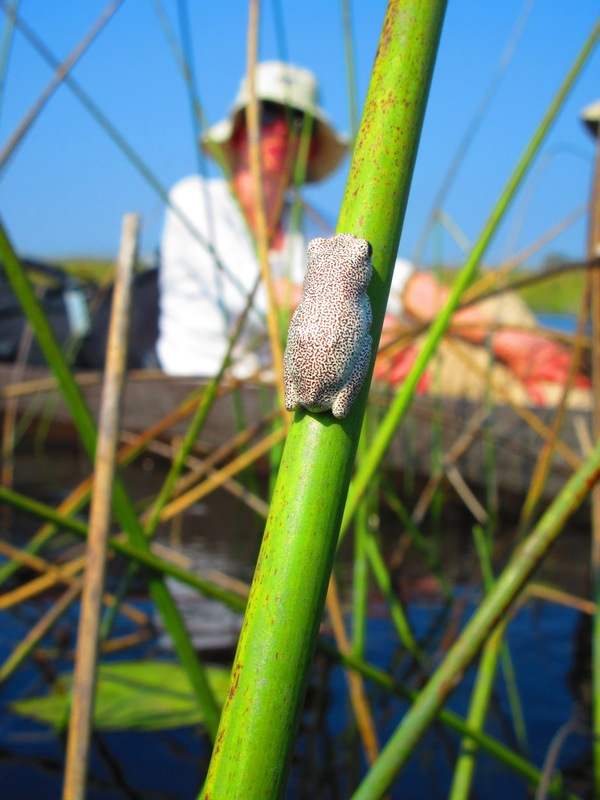 Sounds like a wonderful relaxing visit, for the most part, to the Okavango Delta. The boat ride sounds lovely. Sorry the birthday celebrations were cut short, but at least you celebrated a bit, despite being in the middle of nowhere.